Dollar Bill's! Amazing Dollar Point home with a fabulous private hot tub, landscaped yard, wireless internet and more! 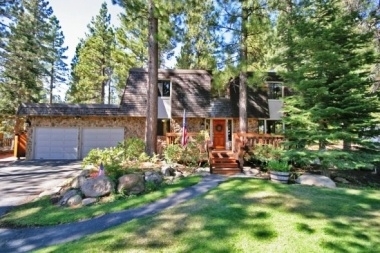 This one-of-a-kind home is located in Tahoe City with perfect access for year round fun! It is located in a private community with summer pool and tennis courts that are only a block away as well as your own private beach just 8 blocks away. The home has been outfitted entirely as a vacation rental with 42' plasma TV in the living room, 19' LCD flat panel TV in the kitchen, TV's in all bedrooms, an XBox in bedroom 5, gas burning fireplaces in the kitchen nook and the master bedroom, a huge master bathroom with a sauna and oversized jacuzzi bath tub, beautiful deck with a gas barbeque, and allows pets with an additional $200 deposit. This wonderful home is perfect any time of year so don't miss out on the opportunity of a lifetime!